Netanyahu walks out of meeting with Druze leaders when protest head says Nationality Law makes Israel an 'apartheid state'. 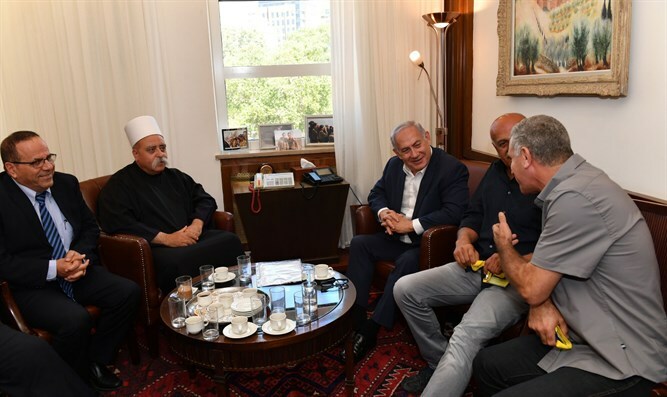 Prime Minister Netanyahu walked out of a meeting with Druze leaders regarding the Nationality Law on Thursday. The meeting had been held in an attempt to hash out a compromise between the Druze community and the government over the Nationality Law. However, Netanyahu cut the meeting short when protest leader Brigadier General Amal Assad interrupted Druze spiritual leader Sheikh Mu'afak Tarif and called Israel "an apartheid state." Netanyahu said that he "will not accept a blow to the honor of the Israeli prime minister or the honor of the state, from those who call the State of Israel an apartheid state." It was a second incident around the law of nationality today. During a ceremony in which scholarships were awarded to Druze students at Ort Braude College, several activists of the Druze protest against the National Law burst onto the stage and verbally accosted Nationality Law initiator Avi Dickter. Some activists called Dichter a "Nazi" and "racist." Police were summoned to the scene removed the activists.